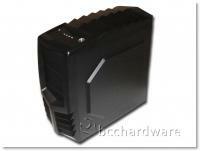 Today we are going to take a look at a case from AZZA - the Toledo 301 mid-tower case. 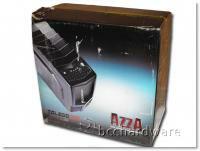 AZZA manufactures cases and power supplies. Their mission statement is simple: Your satisfaction is our success. The AZZA Toledo 301 is packaged as you would expect in the standard cardboard box surrounded by some Styrofoam and in a plastic bag. As you can see from picture, UPS delivered it and they put the packaging to the test. After removing it from all the packaging, the first thing I noticed was its aggressive styling. The Toledo 301 has a saw tooth design when you look at it from the side. It is very much like the louvers you see on some custom cars. It give the Toledo a Transformer'ish look. Starting with the top, front we find the reset button, 2x USB 2.0 ports, a microphone jack, a headphone jack and the power button. Just behind the control panel is the louvered exhaust area. 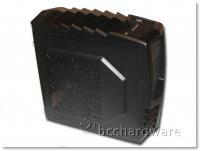 The front has four steel meshed 5.25” bays for optical drives, fan controllers or your favorite 5.25” device. The rear of the AZZA Toledo 301 has your standard openings. Along with the I/O opening for motherboard, there is also an opening for the bottom mounted power supply, seven expansion slots, and four aperture openings for water cooling and a lone opening for a single 120mm exhaust fan. The bottom of the Toledo has two openings; one is for mounting your power supply with its intake drawing from under the case - my preferred mounting position. When done this way, it’s not pulling hot air from inside the case. 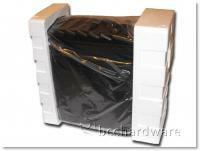 The Toledo also has a second opening for mounting either an 80, 90 or 120mm fan. The bottom also has nice tall feet for it to rest on. They measure about 16mm tall which definitely helps with air flow for the bottom mounted PSU. Most cases I have used or seen do not have this. The left side panel of the Toledo has a raised area which is vented and comes with a 250mm blue LED intake fan already mounted, but it is pre-drilled for 2x120mm or 2x140mm fans if so desired. The right side panel is solid but does have the same raised area as the left panel. On the next page we'll take a closer look at the inside of the case before we get on to installation and testing.